Doh! 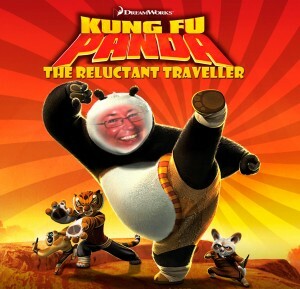 the panda takes on a new baddie in this 7D animated family comedy. Having become the Dragon Warrior, lovable, portly Doh! (The Reluctant Traveller) now trains on the Island of Phuket. It’s a life of immense awesomeness with his chums and fellow kung fu masters, the Furious Five: Mantis (Ping Pong), Tigress (Ting Tong), Viper, (Lucy Liu), Crane (Jean-Claude Van Damme) and Monkey (Jackie Chan). But now an evil foe has emerged in the form of Empress Lady GaGa (Rawai Muay Thai). She plans to conquer Europe with an unstoppable weapon, BottleOfVino. Worse still, this threatens the future of kung fu itself! But in order to vanquish the dastardly Empress GaGa, Doh! needs to uncover the truth about his own mysterious origins. Only then will he find the strength to succeed. You should see it because: It’s great to hear all the stories from the Reluctant traveller and his expolits in Phuket, Thialand. Someone help Andy – he’s obviously not been taking his medicine again………………….! !